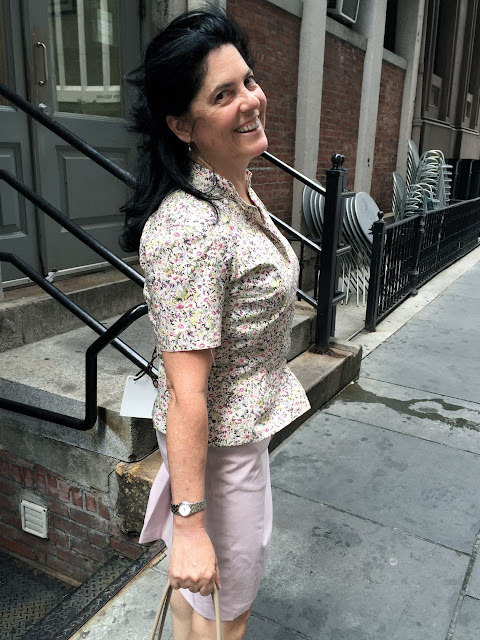 male pattern boldness: Susan Models Summer Separates! 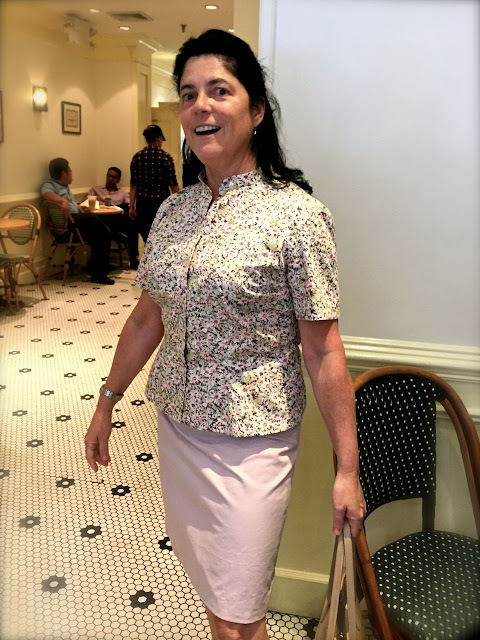 I met Susan downtown yesterday for a quick repast and lightning-fast modeling session of the skirt and blouse I designed for her. 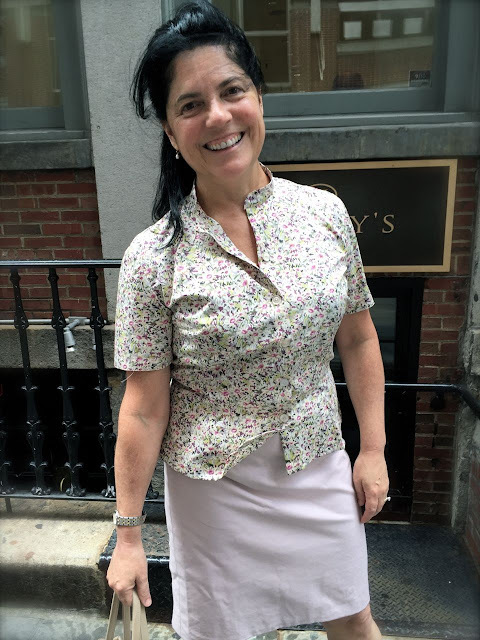 Susan's blouse is made from a vivid cotton poplin Liberty of London floral print. Her pencil skirt is a bottom-weight soft cotton woven. The color is a pale raspberry. It coordinates with the floral beautifully. The fitted blouse buttons in front and has a simple mandarin collar and short sleeves. It flares slightly below the waist. 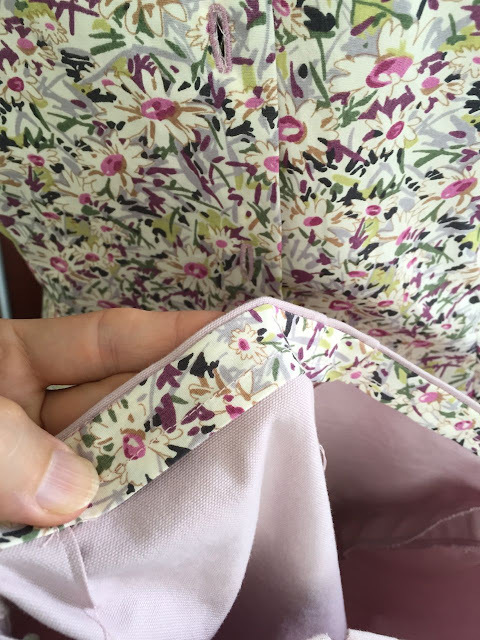 The skirt has four darts and a kick pleat in back. 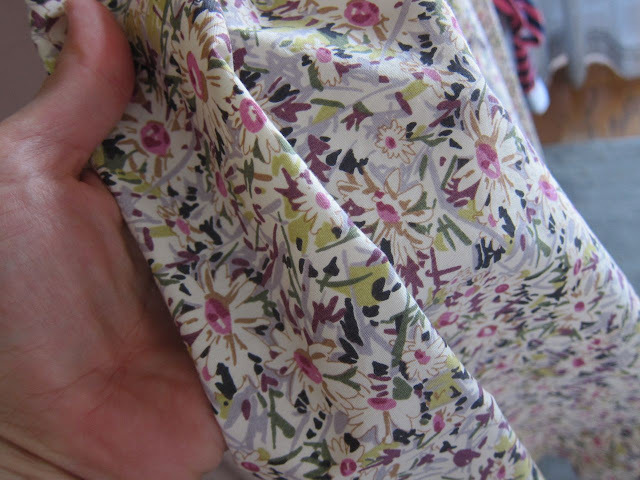 Rather than use petersham ribbon, I stayed the waistline with a strip of the same Liberty print from her blouse. 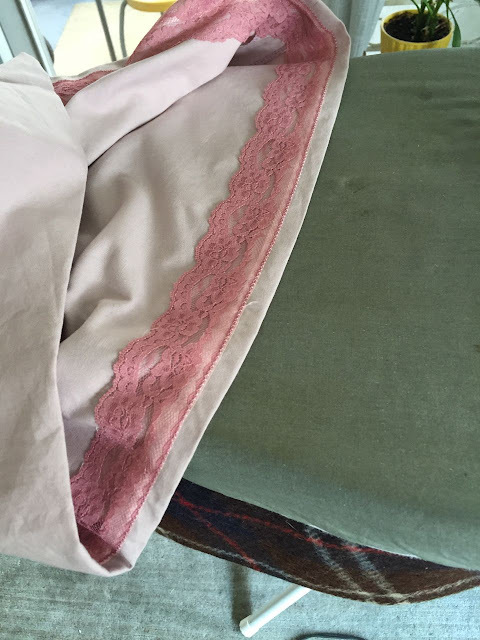 I trimmed the inside hem with lace and hand stitched it in place. 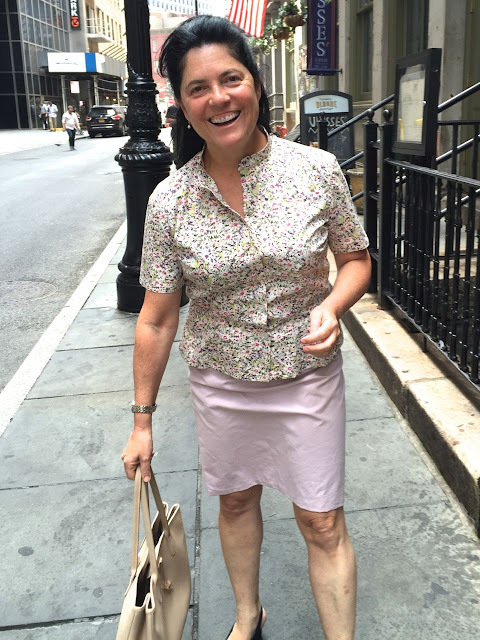 Here's more of the the outfit on Susan on a rather windy Wednesday. I love these colors and patterns on her. They're summery but sophisticated. The lines are simple and unfussy. I'm delighted by the way she looks in this outfit. It flatters her figure and captures her sunny personality. 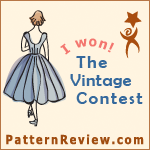 Thank you, Susan, for the opportunity to sew for you! Perfect. She is lovely in her MPB garments! Great job Peter! Everything looks good... style, fit, and colors. Great looking outfit! Well done and Susan looks very happy, too! WOW, turned out great Peter! Gorgeous! Great choice of fabric and superb design. Talk about a fit that flatters! Susan appears joyously unencumbered; a look that's perfect for any season. Thank you both for, "The Summer of Susan". 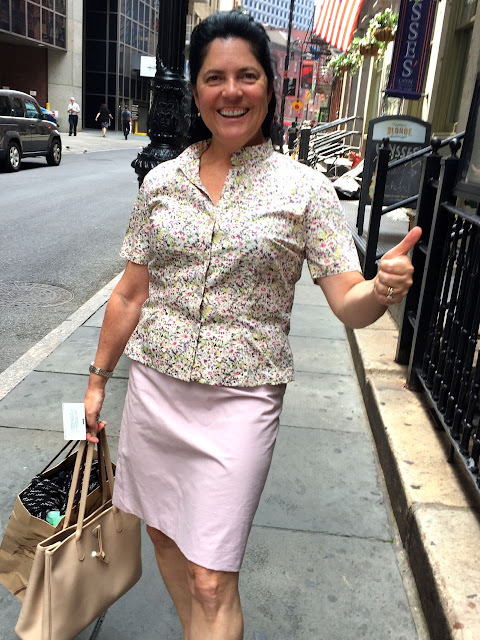 Susan looks GREAT in your MPB (Peter Lappin New York) originals : ) The lace hem on the skirt is a beautiful custom touch. I love the look and she can mix and match these pieces with others garments she owns. Excellent! Good choice of colors as well. It certainly flatters her figure. And the collar/neckline calls attention to her face, that oh so emotional part of the being. If I may ask, would the waist look a smidgen better with a half inch more ease each side? And would the blouse be more flattering if the side darts were say an inch tighter each? (Not every woman is comfortable with a great display of form in a blouse. She may not as well.) 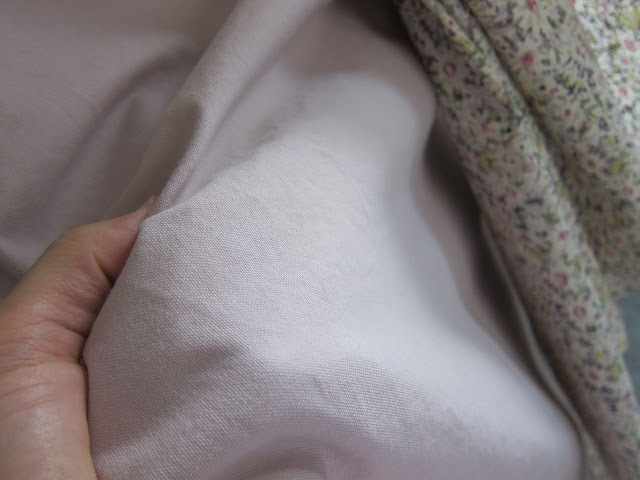 The lace on the inside of the hem is a nice thought. Excellent job. Your reputation grows yet again. The fit ... so wonderful! I hope she loves them as much as the rest of us do! Peter, I love you. I do. So permit me this once: it seems to me that this beautiful blouse is one cup size too small. Wrinkles point to where there's not enough fabric, I believe. As wonderful as this outfit looks, I agree with you SJ Kurtz. A bit more attention to fitting the bust and a tiny bit more ease at the waist. Actually using the FBA for 1 cup-size larger would add that tiny bit at the waist automatically, I think. The draglines always point to the need for adjustment. I will say that your choice of fabric and details is fabulous. It always takes a few tries before getting things perfect. Keep it up, you have the touch, Peter. Lovely job. I like all the little details - the matching waist band, the lace quasi-hem tape - very fun. I think I recognize the tiling in your fave coffee shop/fitting room. It turned out beautifully!